Feeders in Ontario • Bearded Dragon . org . Does anyone know where I can get a good variety of feeder insects in the Hamilton, Ontario area? I've been looking around and it seems every shop is trying to price gouge. Online is cheaper, but shopping online requires huge orders and for one beardie, that really doesn't make sense. I want to try feeding some silkworms, hornworms, and phoenix worms to see if my beardie enjoys them, then I might up the order once I understand what it is I need. Any advice would be appreciated, thanks! Starting a colony is not an option for me right now. Anyway I've decided to try recorp.ca but they're really slow in responding to order requests. I sent in a question on the 30th of Jan, they got back to me on the 5th of Feb, and I "placed" my order that same day, still no response. Just wanted to update, I received my order on the 22nd of February. That took forever -_- luckily I still had enough food to keep my little guy happy until then. i use them a lot and they are always giving me nice live fresh feeders! they have everything except phenox worms..
does anyone know of a canadian feeder site that has phoenix worms? Killzone3265 wrote: does anyone know of a canadian feeder site that has phoenix worms? The only one I've found so far is recorp.ca (which I mentioned in my earlier post). It takes a little while to get through the order process, but you can get 3-4 cups of them in one standard shipment (thus saving on shipping fees) and they're not too bad price-wise ($8.50 CAD per 100 of the medium or large, or 150 of the small/extra small). If anyone knows of other canadian retailers dealing in PWL I'd love to hear about 'em. We supply Phoenix Worms to Bug Order in AB, Super Cricket in SK, and Recorp in ON. These distributors sell direct to customers and some pet stores. Super Cricket in SK charges $9.95/100 (med,lrg) but they will match the $8.50/100 (med,lrg) prices from Recorp. Just place your order then e-mail them with the info and they will credit you back the difference. I just ordered through her. You get your order in 2 business days! There's no minimum order, she carries every bug, including phoenix worms and her prices are amazing! I average spending 8cents per bug in the stores. I've now gone down 2cents per bug making them about 6cents having them shipped to my door! -Just let her know what bug you want and how many and she'll send you a price. Highly recommend! And feel free to say Holly on BD.org recommended her and says hi. 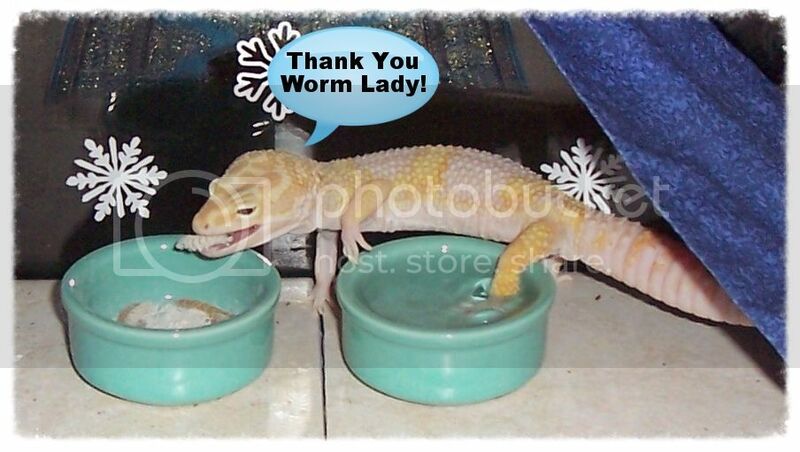 I'm so glad I checked out this site, Worm Lady, you sound wonderful and if Holly likes your worms, I will too. I'll have to check to see what I need and get back to you. I have 6 dragons, 5 adults and a juvie, and would like to get them something different than supers. Thanks, Holly, for the recommendation. sweetiepie9 wrote: Thanks, Holly, for the recommendation.